This cleaning brush is specially developed with Schinsleder for cleaning and maintain Birkenstocks. The brush has different functionalities. 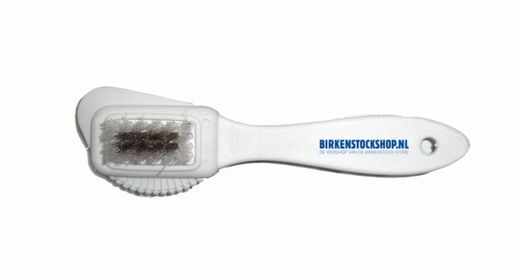 A part of the brush reaches difficult areas, for example with the T-bar sandals of Birkenstocks around the toe area. The brushes are designed to rub dirty easily, but this does not damage the material. It is easy in use, because of the shape and it has this beautiful Birkenstockshop logo on it. The brush cleans and removes dust and dirt. Additionally roughen the different types of leather, including suede leather footbed Birkenstocks which give a used footbed the orignial look back. For best results it is recommended to clean the footbed with Shoeboy multi clean, making the footbed surface look even better Thereafter, the footbed can be protected by the Anti Rain spray. As a result, the suede toplayer of the footbed it perfectly cleaned and protected against dirt.